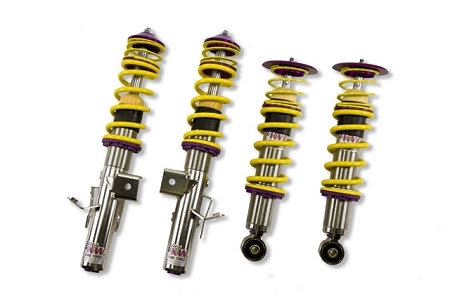 KW Suspension has produced arguably the best coilover system on the market for the performance enthusiast. KW held back nothing in the attempt to produce one of the highest quality and best producing coilover systems on the market. Every part used is of the best quality and works in harmony with each other. For these Variant 1 coilovers, KW determined the best shock damping, and pre-set it so you don't have to worry about having the right balance. The spring rates and damping adjustment on these Variant 1 coilovers is designed to offer the best possible handling while taking into consideration that many customers drive these daily and need that daily comfort. Fully height adjustable and includes everything you need to swap your factory suspension for a true performance setup.